This is taken from VE Issue 6 - enjoy! What would modern British interior design be without the Scandinavians? Is there a homeowner in Britain, for instance, who hasn’t at some time had to rely on Ivar or Expedit, or Billy to bring some semblance of order to their chaos? But long before Swedish IKEA took over the world, a Danish integrated storage solution promised to rationalise mid-century British homes and project them into a bright, clutter-free future. And 60 years on from its original conception, it is still delivering on its promises: the wall-hung modular storage ‘systems’ devised by architect-turned-designer Poul Cadovius have stood the test of time, with some vintage combinations changing hands for thousands of pounds. Cadovius, who died last year aged 99, was a legend of the Danish industry, designing and producing many classic pieces such as the ubiquitous ‘Pia’ chair (not to be confused with Tore Ahlsén’s earlier garden chair of the same name). But it is as a pioneer of væg møbler – modular floating wall unit systems – just after the end of the Second World War that he is perhaps best known in Britain. The principle is simple. By replacing floor-standing furniture with storage units attached to the wall by means of battens, bars and fixings, he could free up lots of floor space – especially welcome in bijou post-war flats and houses. The company that Cadovius launched at the end of the War, Royal Persiennen, first produced the Royal modular wall storage system, using wooden battens and steel rods/connectors to attach a number of differing units. Of course Cadovius was not the only designer working in modular wall storage: there were also ranges by fellow-Danes Kai Kristiansen, Kurt Ostervig and Preben Sørensen (PS System). In Sweden there was Nils Strinning’s String System (still in production); in America George Nelson’s Comprehensive Storage system and in Britain, of course, Staples & Co's Ladderax, designed by Robert Heal. But the beauty of the Royal was that, once the battens were up, the cabinets and shelves could be attached instantly (without the aid of screws) in multiple arrangements and heights. It was the almost infinite way in which the elements could be put together that was the Royal’s primary attraction. Its flexibility allowed the owner to express creativity and individuality, incorporating elements such as book- shelves, ornament displays, TV, writing desk, dining table in a uniquely personal way. Simple in design, the cabinets were well- made and robust, a standard 80cm (31in) wide, they came in three basic sizes and in teak or rosewood (plus, in later years, white laminate). The system as sold in the UK (by Heal’s, amongst others) also included a freestanding support structure on legs (in wood or steel) if required, or sprung tops and bottoms so that the system could be used as a room divider. Full length back panels were another option – as was a very unusual woven veneer finish of teak and rosewood for some Royal cabinets. Elements included filing cabinets, trays, drinks cabinets, flat and angled shelves, display cabinets, drawers and record cabinets. The Royal System was widely reported to be the most successful of all wall systems, and Cadovius launched a Cado variant, which used a slightly different (and more direct) fixing system, with angled wooden pegged dowels instead of metal fixings, and the cabinets connecting to the front face of the battens. This was less fiddly, easier to set up and more sturdy, and the angled shelf supports were sculptural and quite beautiful. Other ranges followed, including ‘Abstracta’, a lightweight metal modular system for exhibitions and displays (the earliest examples had interlocking wooden shelves, almost like large jigsaw pieces). Cadovius had a positive passion for modular design – combining individual elements of a common form put together to form a flexible and personalisable system. As a designer, he could turn his hand not only to all kinds of furniture (tables, chairs and cabinets) but also to buildings and street furniture (his work includes a curved- topped bus shelter found all over Denmark). At the height of its success his company, now known as ‘Cado’, employed over 300 people, and in 1964 he bought out the most famous Danish furniture firm of the time – France & Søn (which made furniture designed by Finn Juhl amongst others). 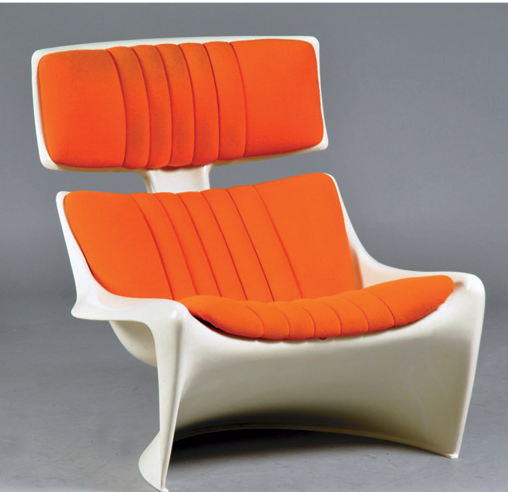 Cadovius began to experiment with new materials such as polymides and other plastics and produced various ultra-modern chair designs with other designers, the most successful combination being with Steen Østergaard. Such business failures forced Cadovius into bankruptcy, though even this could not quell his creativity and passion for design. He continued to work and to create new patents – the last of them when he was 90! You like what you see; it is exactly what you have been looking for. So where can you buy it? Cado shelving is popular and so relatively expensive. It’s fairly easy to get hold of if you look hard enough but don’t hang around good pieces sell quickly. Do beware though – other, cheaper systems are sometimes passed off as Cado work. The PS System for example (though itself an excellent system with many similarities to the Royal) is more cheaply made and should sell for less. The two systems can be difficult to tell apart but the cupboard units on the PS system have different joints. With the exception of the early Royal System, the Cado units are seldom labelled, though look closely and there may be a ‘Made in Denmark’ punched mark on the back of the shelves, units or uprights.